Photos show the men who won the Sidmouth trophy and the ladies who won the triples title together with sponsors Nola Stephens & Lesley Broom. THE Lyme Regis Bowling Club’s men’s championship side were resting this week but, the ladies had a good 8-2 result in their game against Sherborne whilst the men in Lyme 2 went down against Portland Victoria despite winning on 2 rinks. 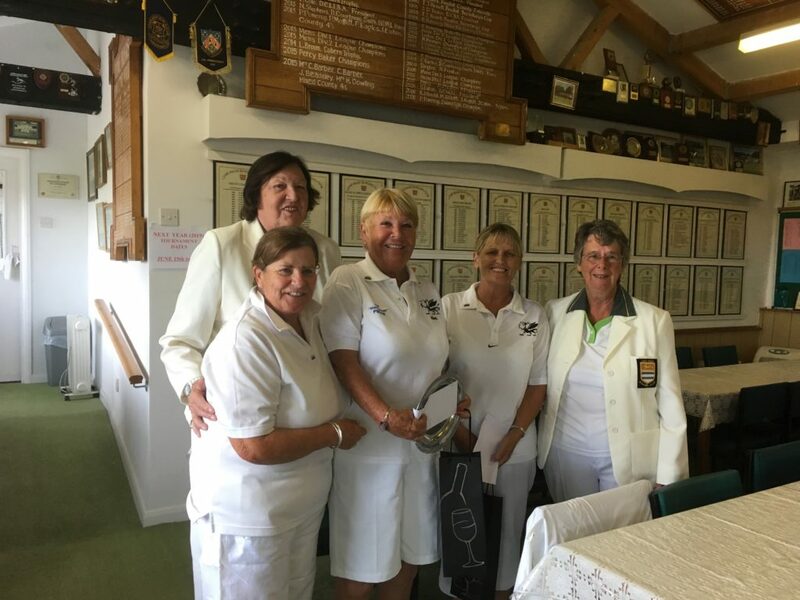 On Saturday, the club held it’s annual Lyme Regis Ladies Triples Tournament. This was the 22nd year that it has been held and there were exactly 22 teams from around the district competing. The competition is on a round-robin format over three games, the two leading scores going through to the final. The winners were a ‘hybrid’ team from different clubs comprising: Pamela Daters, Steff Pinson and Bridget Hodder. The runners-up were a team from Chard bowls club. The trophy was presented by the joint sponsors, Nola Stephens and Lesley Broom. The competition was played in extremely taxing conditions, with a near gale blowing off the sea and the occasional heavy shower. 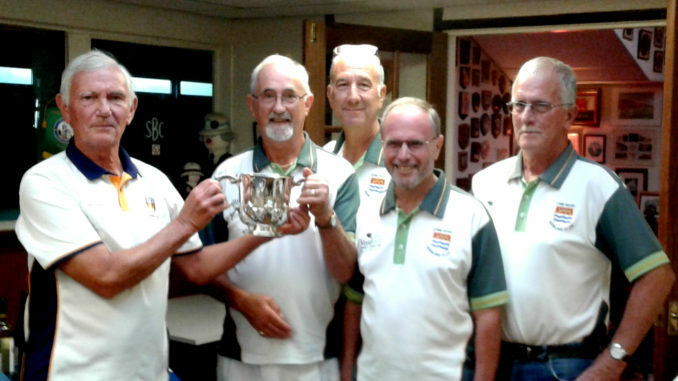 A men’s four – Simon Dowling, Alan Nabarro, Barry Rattenbury and Paul Moffitt -competed in Sidmouth’s invitation Jubilee Cup competition on Thursday. They emerged as the eventual winners from the 14 teams that were competing. A drive was held during the week to raise funds for the RNLI. On Sunday, the club hosted Cardiff Bowls Club in their annual meeting. The two teams played 15 ends in truly appaling conditions and then retired to the clubhouse for refreshments and to dry out! Results from this game next week. West Dorset Men Div 1. Lyme 2, 50; Portland Vic. 58. N Solomon, J Beadsley, J Moseley, C Barber 7-27; S Dowling, R Hobbs, A Nabarro, R Legg 23-15; P Edmonds, P Stephens, B Parsons, D Meylan 20-16. H Dowling, C Pomeroy, L Broom, C Barber 39-17; A Allmanm A Darvill, A Rattenbury, P Weech 16-17; V Henson, N Driscoll, N Stephens, S Rowe 24-18. Attached photos show the men who won the Sidmouth trophy and the ladies who won the triples title together with sponsors Nola Stephens & Lesley Broom.